If you own a cat, then you’re probably well aware of the fact that your feline friend loves to sleep. A lot. On average, cats sleep for about 15 hours every day, and some kittens and older cats will sleep for upwards of 20 hours a day. Cats might be up and active in the afternoon when you get home from work, but more often than not, they can be found lounging on a couch without a care in the world. 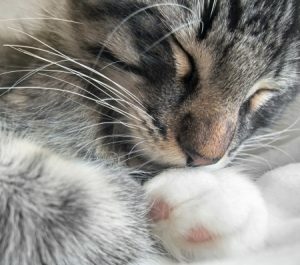 So why do our cats love to sleep so much? Well, some cats might sleep more than others because they’re not getting a nutrient-rich diet or because their bodies simply need more rest as they get older. In general, however, cats sleep more than many other animals because they’re naturally programmed to conserve energy during the day so that they can be ready to get up and hunt at night. Much like large predatory cats, domestic cats are hardwired to save up as much energy as they can when they’re not out hunting. Even though domestic cats don’t need to hunt, their bodies still prepare for it as if they were forced to fend for themselves in the wild. Another reason cats sleep so much during the day is because they don’t get very much deep sleep. While humans will usually drift into deep REM cycles for about an hour or two every night, cats usually only get about five minutes of REM sleep at a time. The rest of the time, cats are usually dozing off without ever fully falling asleep. Want to make sure your cat always has a comfortable place to settle down for a nap? Browse our cozy cat beds and pillows online, or give us a call today to learn more!